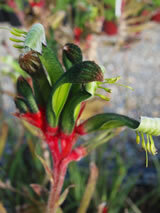 Australian perennial which flowers profusely spring to Autumn. Bright green sword-like leaves form a fan. Rich red and green woolly flowers carried on red stems. This plant prefers a warm sunny site in the garden or may be used in pots. Nectar brings the birds to feed. Remove dead flower heads for continued flowering. Avoid frost.